The James New York brings an inspired experience to SoHo. Located on the corner of Thompson and Grand, the property was conceived and designed as a locally infused, artistically approachable and warmly modern hotel. The James New York features a mix of local, national and international artists, both prominent and up-and-coming. The James SoHo mandatory Facility Fee priced at $40 plus taxes per room, per night which provides guests with the following services, amenities and added value offerings:• Unlimited Local and Domestic Long Distance calls (within the USA) • $10 daily food and beverage credit to our in-room minibar • 10% off at David Burke Kitchen • In room coffee and tea • In room bottled water • Welcome cocktail • Pool deck access (seasonal) • WiFi • Daily wine hour • 24 hour fitness access The facilities fee is not inclusive of service gratuities. Inspired by and imported from our home Tulum in the Yucatan Peninsula, the Gitano Jungle Room inhabits two floors inside the James New York - SoHo. Flanked by signature lush, tropical plants, the GITANO pink and gray, design is paired back and minimal, colonial and opulent. Enjoy a meal at the restaurant, or stay in and take advantage of the hotel's 24-hour room service. Relax with a refreshing drink at one of the 3 bars/lounges. Breakfast is available daily from 7 AM to 10 AM for a fee. Sixty Soho hotel mirrors its stylish surroundings, standing as an inimitable hotel in one of New York City's most vibrant neighborhoods. Stay in big city style, enjoy innovative Thai dining, and imbibe at a pair of stunning spaces at this upscale Soho hotel. Guests must provide a credit card for incidental charges upon check-in. A $150 per day incidental deposit will be charged to guests with either a major credit card or debit card. (Fee subject to change) Bookings of 5 rooms or more will be considered a group booking and are not applicable to FIT rates. "Arlo SoHo is the perfect home base for urban explorers. Located at the intersection of Soho, TriBeCa and the West Village, the hotel provides guests with convenient access to some of Manhattan's best dining, shopping and architecture. The 325 guest rooms are beautifully-designed with efficiency in mind, making the 150-square-foot rooms feel spacious and welcoming. Resourceful storage, fold-down desks and closets with adjustable hanging pegs take full advantage of every available inch of space. High touch materials like rich wood, light concrete and wool carpet bring warmth to the rooms. The hotel's public spaces are perfect for intimate meetings or largescale gatherings with friends and family. The hotel offers daily programming for guests, ranging from mixology classes and live music, to engaging discussions and movie screenings. The lobby is flanked by Bodega, a well-stocked, 24-hour pantry that provides an efficient and fresh alternative to room service at the hotels, serving fresh fare, coffee, and snacks from Farm to People's network of hyper-local purveyors. Through a partnership with Fancy.com, the gift shop section of the Bodega sells products from global small businesses, as well as Arlo's signature ""Deep Woods"" line of room sprays, candles and car fresheners. The remaining public spaces, the Library, Studios and Living Room, are open as coworking areas, private meeting rooms or lounge spots. Arlo SoHo also has three distinct food and beverage venues: Harold's, Arlo Lobby Bar and Arlo Roof Top. Harold's is an all-day restaurant serving breakfast, lunch and dinner, with a menu of seasonal American cuisine with elevated twists. Arlo Lobby Bar offers an extensive menu of craft cocktails, along with light bites from Harold's and a carefully curated list of biodynamic wines and local beer. 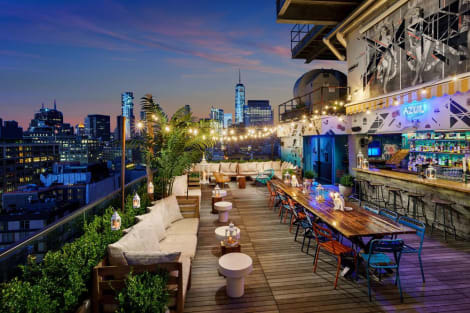 Arlo Roof Top is an urban oasis in the heart of downtown Manhattan, with stunning views overlooking the cityscape." Take advantage of recreation opportunities including a nightclub and a 24-hour fitness center. Additional amenities at this hotel include complimentary wireless Internet access, concierge services, and a hair salon. NoMo SoHo is perfectly situated in New York City's SoHo district, an area renowned for fashion, art, and design. The modern, sleek design and energetic ambiance of the hotel are evocative of the surrounding neighborhood, which offers plenty of opportunities for shopping, dining, and exciting nightlife. Unique to the neighborhood, NoMo SoHo is one of the tallest buildings for blocks and features one of a kind panoramic views from the 26 floors of the hotel. Guests are just minutes from New York's remarkable cultural and historical landmarks, including the nearby neighborhoods of Little Italy, Chinatown, Lower East Side, and SoHo-- plus Battery Park, New Museum, the 9/11 Memorial and Museum, the Empire State Building, and a quick boat ride to Ellis Island and the Statue of Liberty. NoMo SoHo features a conservatory-style restaurant that serves delectable dishes from award-winning chefs and a library-style bar that offers craft cocktails and an extensive wine selection. As of 1st April, 2019 NoMo SoHo's amenity fee includes: Daily wine hour from 5p-6p, Bottled water in room upon arrival, Coffee and tea service 6a-9a daily, Jogging cart with towels-bottled water-whole fresh fruit-and jogging map, Spin classes at Monster Cycle, Use of handy™ smartphone mobile device. Save your battery and use ours!, Exclusive discounts at SoHo Insider neighborhood retail partners, International calls to over 10 countries, Assorted newspapers in lobby, Guest room and public area WiFi, Guest room Google Chromecast streaming, 24-hour access to fitness center, & Turndown service upon request. Featured amenities include a 24-hour business center, complimentary newspapers in the lobby, and dry cleaning/laundry services. Planning an event in New York? This hotel has facilities measuring 484 square feet (45 square meters), including a meeting room.